The Chi-square distribution is a measure of difference between actual (observed) counts and expected counts. It is most often for hypothesis tests (such as when there are >2 samples and comparing proportions) and in determining confidence intervals (such as the confidence interval for the standard deviation). Chi-square test for independence in a "Row x Column" contingency table. Chi-square test to determine if the standard deviation of a population is equal to a specified value. Unlike the normal distribution, the chi-square distribution is not symmetric. Separate tables exist for the upper and lower tails of the distribution. This statistical test can be used to examine the hypothesis of independence between two attribute variables and determine if the attribute variables are related and fit a certain probability distribution. Ideally used when comparing more than two samples otherwise use the 2-Proportions Test (with two samples) or 1-Proportion Test (with one sample). See Hypothesis Test Flow Chart as a reference. 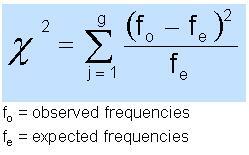 The GOF test compares the frequency of occurrence from an observed sample to the expected frequency from the hypothesized distribution. As in all hypothesis tests, craft a statement (without numbers) and use simple terms for the team's understanding and then create the numerical or statistical version of the problem statement. Reject the null hypothesis if the p-value is LESS THAN the alpha-risk. For a Confidence Level of 95% the alpha-risk = 5% or 0.05. Excel asks for the "Actual" range which is the "Observed" range. 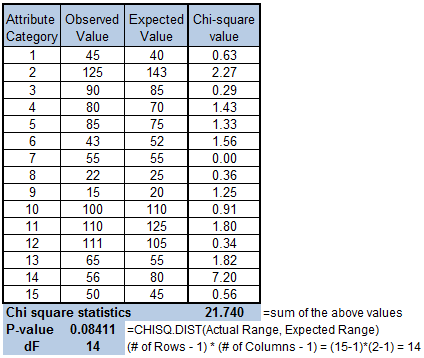 See the table below of the Observed values, Expected Values, and each chi-square value calculated using the formula above. The sums of all of them is the total chi-square statistic. If the Level of Confidence is 95% (alpha risk = 0.05), then the p-value calculated above is > than 0.05. The decision is to fail to reject the null hypothesis and to infer the null hypothesis. There is insufficient evidence that results are not due to random chance. Tests the hypothesis of independence between two attribute variables. The test does not require an assumption of normality. Develop null and alternative hypotheses. 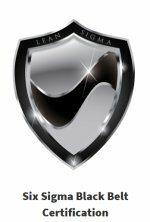 Translate the statisticalal results into the practical result. Create the table of Observed values and create the table of Expected values. Creating a table helps visualize the values and ensure each condition is calculated correctly and then the sum of those is equal to actual chi-square calculated value. This also helps to understand how difference observed values can affect the results of the test. In the example above, a small change in one or a couple of the data points (a higher separation between the observed and expected value) can create a p-value less than 0.05. Calculate Expected values for each condition (fe). fe = (row total * column total) / grand total. Notice that the example begins with the table to help visually explain the problem and makes it easier to follow the problem solving process.